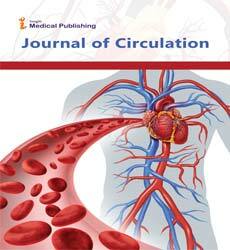 Journal of Circulation is circulatory Journal which mainly focuses on Heart, Blood and Blood vessels. The Journal delivers the highest quality peer-reviewed articles, reviews, and scholarly comment on pioneering efforts and innovative studies across all areas of blood circulation. The circulation of blood is vital which makes our body function properly and it works in two loops. In systemic loop, heart pumps blood to all body parts to transport oxygen, nutrients, hormones and other gases and to collect carbon dioxide waste. In pulmonary loop, heart pumps blood to lungs to release carbon dioxide and collect new oxygen. The Journal covering both broad and specific topics of interest welcomes articles from authors internationally. It aims to bridge the gap between theory and practice and provide cardiac surgeons, physicians, specialists and whoever involved professionally or academically in the field with a forum to share, explore and gain knowledge on contemporary research for better cardiac health. Major areas of research include cardiovascular diseases, interventional procedures, advanced cardiac practices, quality outcomes of the treatment and improving patient care. All submitted articles should report original, previously unpublished research results and must not be under consideration for publication elsewhere. Manuscripts should follow the style of the journal and are subject to both review and editing. The benefits of publishing in the journal include fast publication, professional editing and proof reading services, fast but fair and comprehensive peer-review and decision via Editorial Manager System by elite group of editors and reviewers and worldwide dissemination of your research results in electronic format (PDF, HTML).